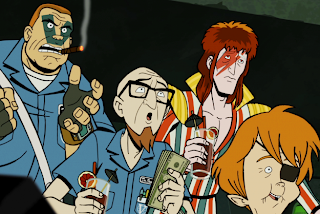 Venture Bros Junkies....your fix is nigh!! We brave few, starved for animation by our pseudo-adoptive, ultra creative cousins Doc Hammer and Jackson Publick huddle up to the glowing warmth of a flat screen teevee for just a morsel of holiday themed adventure with Doctor Thaddeus S. "Rusty" Venture and friends....and laugh and swoon and then feel empty inside once more ..returning to our lonely love seat to mark the number of days we must wait until a NEW Season of Venture Brothers will fill our lives with purpose. To you, the Venture Bros fan, I give the one fist salute. So anyway..there's a new Halloween special in town! Thaddeus Venture and Sgt. Hatred with a particularly spectacular new physical attribute I don't recall him being blessed with in past episodes, join Pete White and Master Billy Quizboy on candy gifting duty to those brave few who serpentine their way past the laser sentries. In another part of the compound, Dr. Orpheus gathers his magically inclined brethren for cocktails, canapes and A SPECTACLE OF FORBIDDEN ARTS!!! Imagine that said in Orpheus's voice..way more fun than mine. Side note: Last night I was at a Halloween party and I met an awesome photographer girl and "Your Own Personal Jesus" came on..because it was that kind of party..and she asked me who was playing and I yelled "THAT GUY FROM DEPECHE MOOOOODE!!" in the voice of the Monarch. You're welcome. ALSO at the same time, Dean, who is looking like he is entering a goth phase, joins Hank and Dermott (dressed in everyone's favorite anti-hero costume of many years ago) for a night of mayhem turned discovery as Dean visits a spooky old house the boys had been warned to never enter. 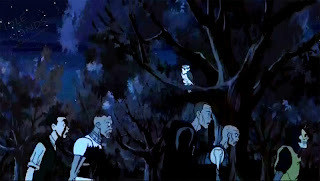 As you might expect, Thaddeus and his crew are awesomely mean spirited, Dr. Orpheus's crew garner the bulk of the laughs through their magical feats and conversation on said feats, and we get a major bomb dropped on the boys which is sure to color their development in the upcoming season. Suffice to say, this 22 minute 13 layer turbo chocolate crunch cake is required eating and a perfectly hysterical addition to your Venture library. I advise repeated viewings to soak up all the little jokes thrown away for further action or buried by other character's lines and a hearty press of the pause button during The Outrider's magic display, especially if you're a horror fan, and therefore one of the best people on the planet. Watch it a lot! I thought the special was beyond belief! I gave it 10/10 Dean.. clone slugs.